When diagnosed with a gluten allergy the biggest change to your lifestyle will be your cooking habits. Gluten is found in many food products, including some you wouldn’t expect. So when you have your diagnosis you should start to educate yourself on what foods you need to avoid and how to avoid them. You are going to have to be more careful with your eating habits now you know you have a gluten allergy. You should therefore use the situation as an opportunity to learn to cook! If you are cooking all your meals yourself from scratch you can be sure that there are no gluten based products going into your food. 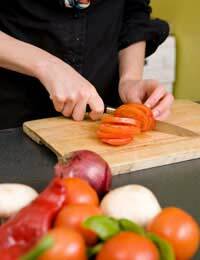 Leaning to cook is a positive step you can take to adjust to your new lifestyle. You will feel more in control of your allergy if you are the one beating it. Learning to cook gluten free recipes means you can still enjoy delicious meals even though they are gluten free. There are plenty of products on the market that are gluten free and you could use these instead of cooking yourself but where is the fun in that? It’s great to learn a new skill and just because you are cooking gluten free meals it doesn’t mean you won’t be able to turn your hand to cooking with gluten too should you hold a dinner party etc. There are plenty of gluten free recipe books on the market and a quick Internet search will help you find out where to get them. You can even buy books on specific courses. Gluten free dessert recipe books for example will help you whip or some of your favourite sweet treats without compromising your allergy or sparking the symptoms. Once you’ve tried a few recipes you should start compiling a folder of your favourites so you always have a point of reference. Before long you’ll become a dab hand at whipping up a whole range of delicious gluten free meals. Learning a new skill is always more fun when you do it with a friend. Ask one of your friends to learn to cook with you. You can get together once a week to try out new recipes and master new skills in the kitchen! You could even ask someone you’ve met at a support group for gluten allergy sufferers if they would like to learn to cook with you. Your support group may even know of details of cookery classes for gluten allergy sufferers. You should also make use of Internet forums for gluten allergy sufferers. You’ll be able to swap recipe ideas and offer each other support while learning your new skill. If you have been diagnosed with a gluten allergy then the first steps to dealing with it begin in the kitchen. Learn a new skill, have fun and master how to deal with your allergy all at the same time. So what are you waiting for? Grab your apron and get cooking!